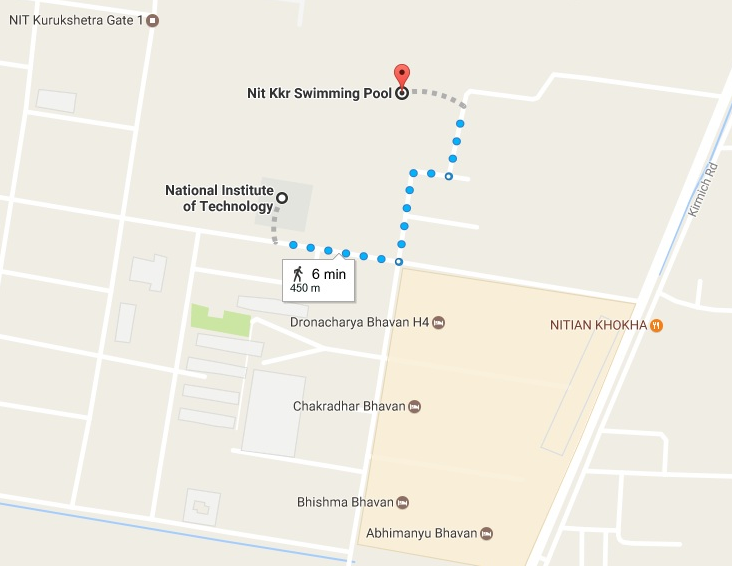 NIT Kurukshetra now has a Swimming Pool of International Standards, 50 Mts. x 25 Mts. Size, with 90 Cm. depth at shallow end and 5 Mts. depth at deeper end. Apart from this it is equipped with Three Spring Boards for Diving at 3 Mts., 5 Mts. and 7 Mts height simultaneously. It is provided with Anti-wave Lane markers to conduct competitions with Portable Take off Boards with Fiber of Olympic type where 60 to 70 people can be accommodated at a time. The swimming pool is operational during the months of March to October every year. The swimming pool has different timings for employees and students. 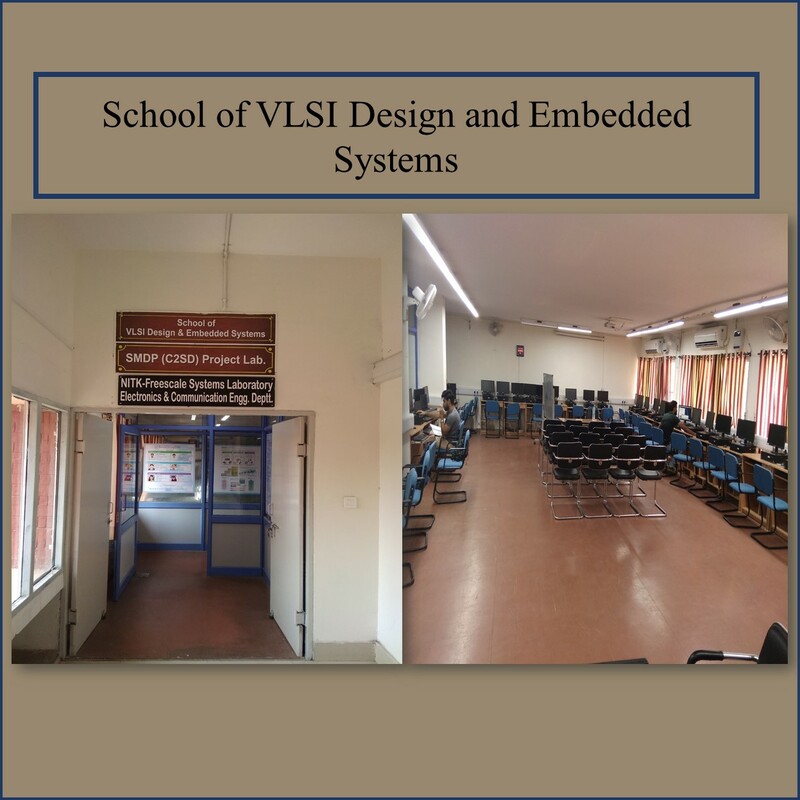 The Institute team also has a different slot where they improve their skills and technique under the supervision of expert coaches. Swimming pool membership is open only to the following categories of persons. Bonafide students of NIT Kurukshetra, and research scholars and their spouse and children’s. NIT Kurukshetra employees (Faculty and staff) and their dependent family members (as per recorded in medical card or Health center booklet). Retired Employees of NIT Kurukshetra and their spouses. Any other person specifically permitted by the Hon’ble Director. Anyone other than the above mentioned will be treated as outsider and will not be entitled to become member of the swimming pool. All the members are requested to Fill-up the prescribed application form and submit it along with two photographs and copy of Identity card/Health card at the office of the Physical Education & Sports Section between 4:00PM and 5:30PM on any working day i.e. Monday to Friday. "Incomplete applications or the applications without proper Identity proof will not be entertained under any circumstance." The format of membership application form, eligibility for membership, fees/subscription, timings and details are available on the Institute website www.nitkkr.ac.in > Section > Sports Section > Swimming Pool. Registered students of NIT Kurukshetra. NIT Kurukshetra Faculty, Staff and their dependent members as per medical card. NIT Kurukshetra Alumnus, Retired Employees of NIT Kurukshetra and their spouses. Spouse and children’s of registered NIT Kurukshetra research scholars. All others (with approval of Hon’ble Director). The swimming pool is an Institute facility operating under the Physical Education & Sports Section. The professor I/C (Physical education) is the head of the all sports activities and facilities. Presently the Physical Education & Sports Section is headed by Prof. D. P. Singh, Professor, Department of Chemistry. A management committee appointed by the Hon’ble Director to make necessary recommendations for smooth running, maintenance and other activities time to time. The staff of the swimming pool will be directly control under the Prof. I/C physical education and swimming pool committee. To prepare the budget and lay down the policy guidelines for smooth running of the pool wards. To decide about membership fees for different categories of users and charges for the guests of the members. To decide about the dates of opening and closing of a swimming season. To decide about pool timings and slots for swimming pool usage. To formulate/revise conduct rules and guidelines for smooth running of the swimming pool. The following minimum numbers of personnel/manpower required for day to day operation and upkeep of swimming pool between 5:30 AM to 9.00 PM. To carry out “maintenance of swimming pool” for the period of 4 Months by deploying following minimum numbers of personnel/manpower from 8:00 AM to 5.00 PM. Pool Cleaning Equipment’s like wall brush, deep bag skimmer, chemical dispenser etc, Safety Equipment’s like life jackets, swimming rings, first aid kits etc. Swimming pool timings will cover some designated periods between 5:30 AM and 9:00 PM only. There will be several slots; each slot will be of 50 minutes in duration with a 5-10 minute gap between slots. Hence the members will be allowed in the pool on FIRST COME-FIRST-SERVE BASIS. The members should form a queue and get inside the pool in an orderly fashion. Maximum Number of swimmers in each slot shall be 50-60. This capacity may be increased in the future. The Swimming Pool Committee will organize supervision of the pool. Diving is permitted in the Diving Area only under active supervision of an instructor. No person will enter the diving area except under advice of an instructor. Three lifeguards and two coaches will always be on duty during every slot. Swimmers and Learners shall be clearly distinguished and appropriately segregated. Learners must wear Red Bathing Caps. In the event of power failure, or due to any other unforeseen circumstances, the pool may be closed or slots may be suspended / cancelled. The swimming pool may be used for special events like Inter NIT, Inter Year or any other swimming competition decided by the Swimming pool committee, Physical Education & Sports Section or a higher authority. In such cases, the regular slots may either be changed or suspended during the competitions. The pool management shall not be responsible for any theft, loss or damage of belongings of members. Members are advised not to bring mobile phones, cash, credit cards, jewelry etc. to the pool. While the management will try to provide some safety supervision, it cannot afford the standards necessary for a fully safe operation. Every member must strive to ensure his own safety and the safety of others around him. Visitors are not permitted to the deck area with or without shoes. They may, however, enter with shoes to the visitors’ gallery. Unauthorized entry into the swimming pool or any portion thereof, is a major offence, and attracts commensurate penalty. Pool timings and slot given must be strictly adhered to by all members. Members (including faculty and staff) will be allowed to enter the pool only after they have signed the register and handed over the Swimming Pool IDENTITY CARDS at the counter “till the issued the swimming pool Identity Cards”. No one will be allowed to enter the swimming pool without surrendering their Identity cards to the supervisor. At the end of the slot period, members are required to sign the register again and collect back their membership cards. Since the swimming pool is being maintained by outside workers, all users (including faculty and staff members) must have a valid identity card to use the swimming pool. Otherwise entry into the swimming pool will be denied. The pool and deck area must be fully vacated in the interval between two slots or when an emergency call is given by the instructor. Children below 4 years of age are not allowed in the swimming pool. No child below the age between 4 to 12 years will be allowed inside the swimming pool unaccompanied by its parents. The parents are solely responsible for the safety of such young children inside the pool premises. Proper swimming TRUNKS/COSTUMES and CAP must be worn during swimming. Ladies, girls and men having long hair, whether swimmer or learner, must use plastic bathing caps during swimming. Decision of instructor is final in deciding whether a particular costume is proper. Learners must wear RED BATHING CAP, fabric for men and boys, plastic for women, girls and men with long hair. Learners are not permitted in the deep end of the pool, i.e. beyond 20m from the shallow end. A learner may qualify as a swimmer only after clearing a test offered by an instructor. During certain designated slots, members should swim lengthwise to avoid collision with other swimmers. Members must have urination and a shower followed by a footbath at the door of the shower room before entering the pool. Use of oil before entering the swimming pool is strictly prohibited. Use of soap or any other chemical is strictly prohibited in the swimming pool. Playing, jumping, quarreling or any distracting behavior in the swimming pool is strictly prohibited. Smoking, drinking and consumption of eatables are strictly forbidden in the swimming pool premises. Do not dive into the pool where the depth is less than 5 feet. Avoid spitting or blowing the nose in the water, use the scum-gutter. Pets are not permitted in the swimming pool premises. Pool management is not responsible for thief, loss or damage of belongings. No photography is allowed in the pool premises except when a written permission has been obtained from the Chairman, Swimming Pool Management Committee. If a member suffers from a skin ailment, a chest, ENT or eye infection, an open wound or any medical condition that is unhealthy for him/her or for fellow swimmers, he/she should voluntarily refrain from using the pool till such time that the medical condition is corrected. Ladies should not use the swimming pool during the menstrual period. Do not stay in the pool when there is lighting in the sky. Do not swim with full stomach of food. Those who do not know swimming must confine themselves to the less deep parts of the pool. Instructions of instructor or lifeguards on duty will be the final word at the pool. Membership of those not obeying instructions of the lifeguards on duty will be cancelled. Clear the pool when asked to vacate the pool when the supervisor whistles. For complaints and suggestions, please contact Chairman, Swimming Pool Management Committee. Never argue with a pool staff. These principles are imposed only for your safety and comfort. Even though the pool may look perfectly safe, the swimmers are advised to exercise extreme caution while swimming. The swimmers should not swim if they develop muscle cramps or feel faint. Users having heart problems must get medical opinion before swimming. Also, swimmers must do warm up exercise before entering the pool. If you find anybody struggling or sinking in the swimming pool, never jump into the water to save him/her, Instead, immediately throw one of the ring buoys available on the side of the swimming pool to the swimmer in distress. Then inform one of the lifeguards on duty.